Brandt, R.A.M. 1974. The non-marine aquatic Mollusca of Thailand. 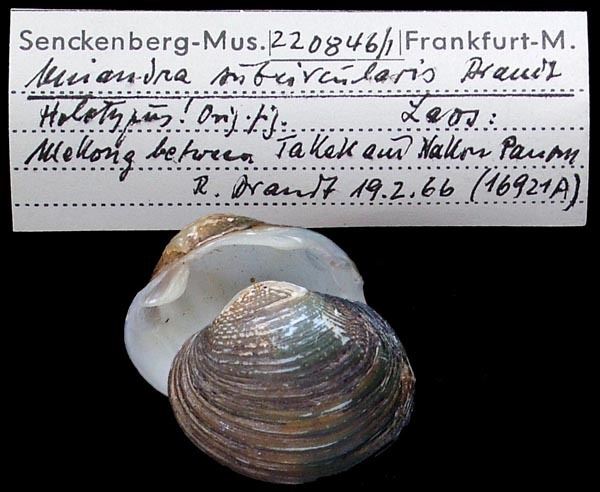 Archiv für Molluskenkunde 105: 1-423. Lea, 1870, Synopsis Fam. Naiades: 84. Simpson, 1900, Proc. U.S. Nat. Mus. : 588. Preston, 1912, Rec. Ind. Mus. : 282. Simpson, 1914, Descr. Cat. Naiades: 242. Brandt, 1974, Arch. Moll. : 264. Brandt, 1974, Arch. Moll. : 328, pl. 29, fig. 104. Type(s): PARATYPES MNHN_MP_3526, Thailand: Mekong at Nakon Panom. Brandt, 1974, Arch. Moll. : 325, pl. 28, fig. 94. Type(s): PARATYPES MNHN_MP_3517, North Thailand: Maenam Loei at Loei toen. Brandt, 1974, Arch. Moll. : 324, pl. 28, fig. 93. ‘Prime’ Brandt, 1974, Arch. Moll. : 317. Brandt, 1974, Arch. Moll. : 324, pl. 29, fig. 101. 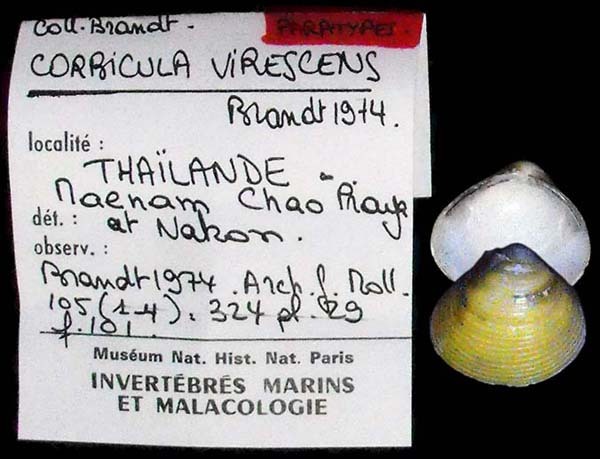 Type(s): PARATYPES MNHN_MP_3551, Thailand: Maenam Chao Praya at Nakon Sawan. Brandt, 1974, Arch. Moll. : 327, pl. 29, fig. 103. Type(s): PARATYPES MNHN_MP_3545, Thailand: Mekong at Nakon Panom. Brandt, 1974, Arch. Moll. : 284, pl. 21, fig. 38. 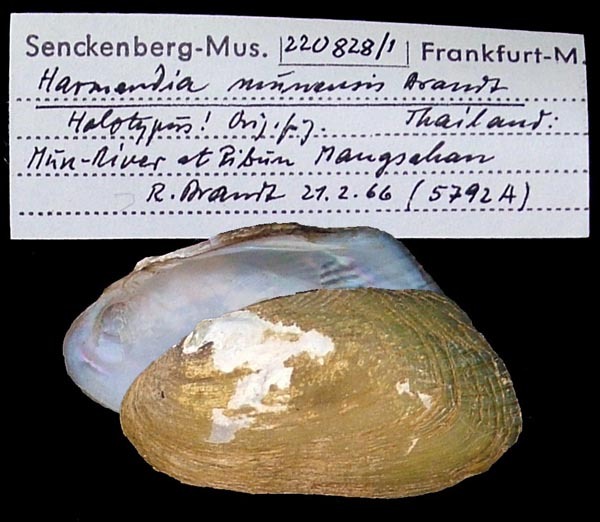 Type(s): HOLOTYPE SMF_220828, Thailand: Mun River at Phibun Mangsahan. Hyriopsis (Limnoscapha) desowitzi Brandt, 1974. Brandt, 1974, Arch. Moll. : 274, pl. 22, fig. 43. Brandt, 1974, Arch. Moll. : 256, pl. 18, fig. 20. Brandt, 1974, Arch. Moll. : 301, pl. 26, fig. 66. Type(s): PARATYPES MNHN_MP_1543, Mun River ca 6 km W of Ban Tha Tum, Surin Prov., Thailand. Haas, 1969, Das Tierreich: 122. Brandt, 1974, Arch. Moll. : 279. Brandt, 1974, Arch. Moll. : 304, pl. 26, fig. 68. Brandt, 1974, Arch. Moll. : 297, pl. 25, fig. 62. Type(s): HOLOTYPE SMF_220841, Thailand: Maenam Pong at Pong Nip Dam; Prov. Kon Kaen. Pisidium (Odhneripisidium) prasongi Brandt, 1974. Kuiper in Brandt, 1974, Arch. Moll. : 333, pl. 30, fig. 5. ‘Benson’ Brandt, 1974, Arch. Moll. : 254, pl. 18, fig. 17. Brandt, 1974, Arch. Moll. : 307, pl. 26, fig. 70. Brandt, 1974, Arch. Moll. : 293, pl. 24, fig. 56. 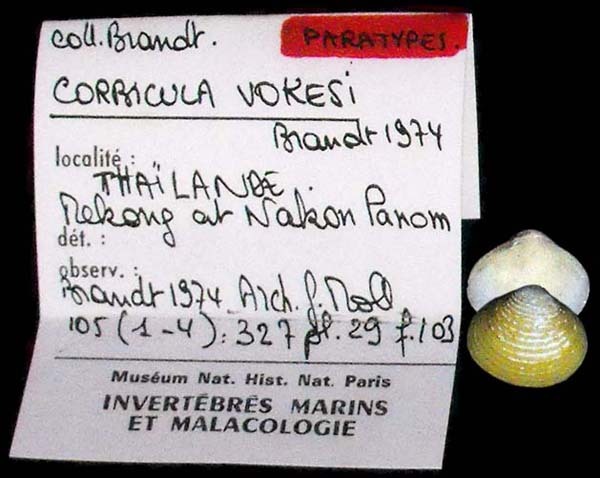 Type(s): HOLOTYPE SMF_220846, Laos: Mekong River between Takek and Nakon Panom. Uniandra contradens rusticoides Brandt, 1974. Brandt, 1974, Arch. Moll. : 290, pl. 24, fig. 50. 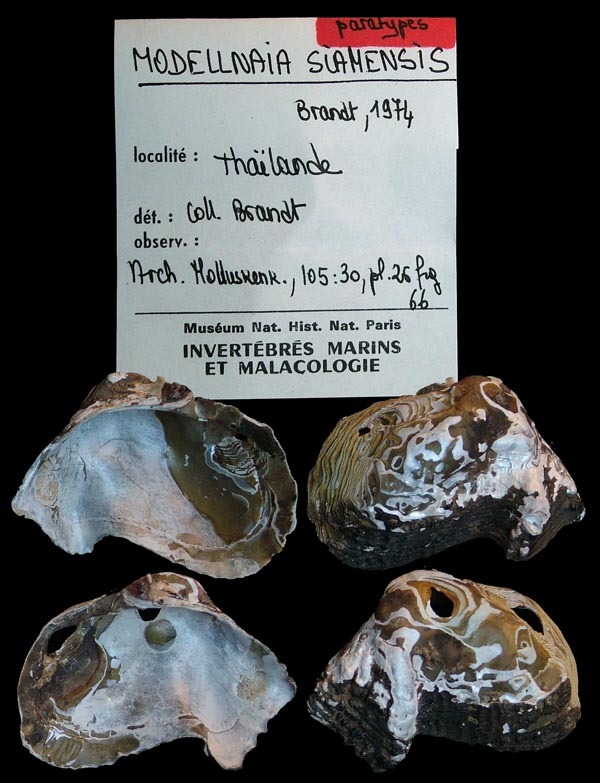 Type(s): HOLOTYPE SMF_220845, Thailand: Klong Min near Chandi; Chawang Distr. ; Prov. Nakon Sritammarat. ‘(Boettger) v. Martens’ Haas, 1914, Conch. Cab. : 198. Modell, 1942, Arch. Moll. : 189. ‘Martens’ Haas, 1969, Das Tierreich: 101. ‘Martens’ Haas, 1969, Treatise on Invert. Paleo: N420. ‘(Martens)’ Brandt, 1974, Arch. Moll. : 289. Millard, 2001, Class. Moll. : 1064. Batissa similis Prime, 1860. — Brandt (1974: 312). Brachidontes arcuatulus (Hanley, 1844). — Brandt (1974: 257). Chamberlainia hainesiana (Lea, 1856). — Brandt (1974: 276). Corbicula arata (Sowerby, 1877). — Brandt (1974: 313). Corbicula baudoni Morlet, 1886. — Brandt (1974: 323). Corbicula blandiana Prime, 1864. — Brandt (1974: 313). Corbicula bocourti (Morelet, 1865). — Brandt (1974: 314). Corbicula castanea (Morelet, 1865). — Brandt (1974: 317). Corbicula cyreniformis Prime, 1860. — Brandt (1974: 318). Corbicula erosa Prime, 1861. — Brandt (1974: 322). Corbicula fluminea (O.F. Müller, 1774). — Brandt (1974: 319). Corbicula gubernatoria Prime, 1869. — Brandt (1974: 325). Corbicula gustaviana Martens, 1900. — Brandt (1974: 320). Corbicula heardi n. sp. — Brandt (1974: 328). 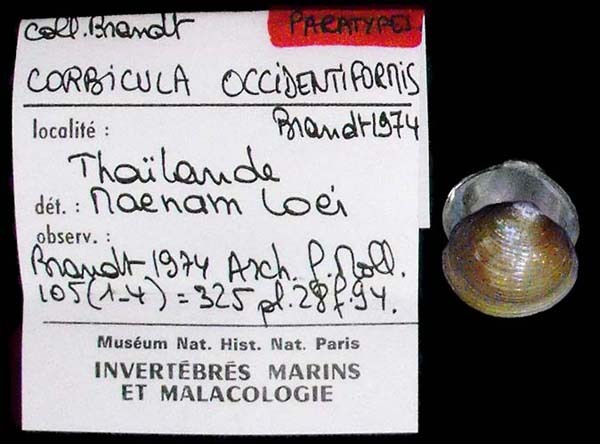 Corbicula iravadica Hanley & Theobald, 1876. — Brandt (1974: 323). Corbicula javanica (Mousson, 1849). — Brandt (1974: 315). Corbicula lamarckiana Prime, 1864. — Brandt (1974: 316). Corbicula leviuscula Prime, 1864. — Brandt (1974: 326). Corbicula lydigiana Prime, 1861. — Brandt (1974: 316). 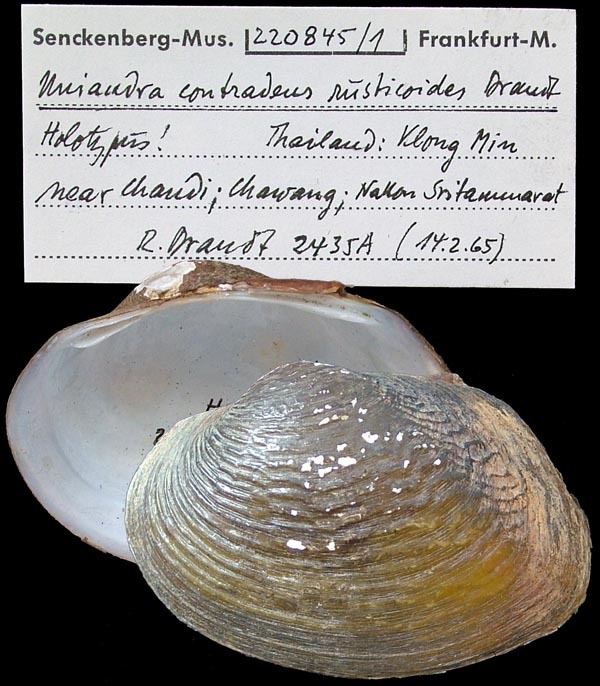 Corbicula messageri Bavay & Dautzenberg, 1901. — Brandt (1974: 327). Corbicula moreletiana Prime, 1867. — Brandt (1974: 321). Corbicula noetlingi Martens, 1899. — Brandt (1974: 319). Corbicula occidentiformis n. sp. — Brandt (1974: 325). Corbicula pingensis n. sp. — Brandt (1974: 324). Corbicula pisidiformis [sic] Prime, 1866. — Brandt (1974: 317). Corbicula regia Clessin, 1879. — Brandt (1974: 320). 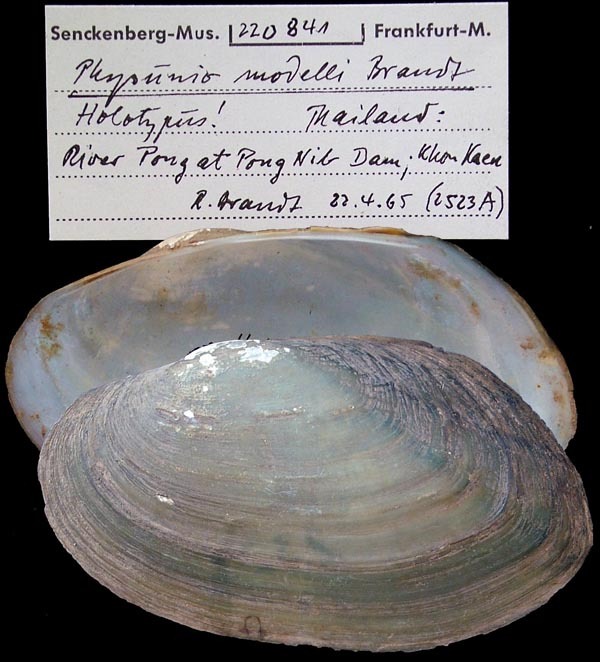 Corbicula siamensis Prashad, 1929. — Brandt (1974: 322). Corbicula solidula Prime, 1861. — Brandt (1974: 326). Corbicula tenuis Clessin, 1887. — Brandt (1974: 318). Corbicula virescens n. sp. — Brandt (1974: 324). Corbicula vokesi n. sp. — Brandt (1974: 327). Cristaria plicata (Leach, 1815). — Brandt (1974: 278). Ensidens ingallsianus dugasti (Morelet, 1892). — Brandt (1974: 288). Ensidens ingallsianus ingallsianus (Lea, 1852). — Brandt (1974: 288). Harmandia munensis Brandt, 1974. — Brandt (1974: 284). Harmandia somboriensis Rochebrune, 1881. — Brandt (1974: 284). Hyriopsis (Limnoscapha) desowitzi Brandt, 1974. — Brandt (1974: 274). Hyriopsis (Limnoscapha) myersiana (Lea, 1856). — Brandt (1974: 275). Hyriopsis (s.s.) bialatus Simpson, 1900. — Brandt (1974: 272). Hyriopsis (s.s.) delaportei (Crosse & Fischer, 1876). — Brandt (1974: 273). Indonaia humilis (Lea, 1856). — Brandt (1974: 286). Indonaia pilata (Lea, 1866). — Brandt (1974: 286). Indonaia substriata (Lea, 1856). — Brandt (1974: 285). Limnoperna siamensis (Morelet, 1875). — Brandt (1974: 256). Limnoperna supoti n. sp. — Brandt (1974: 256). Margaritanopsis laosensis (Lea, 1863). — Brandt (1974: 261). Modellnaia siamensis Brandt, 1974. — Brandt (1974: 301). Novaculina siamensis Morlet, 1889. — Brandt (1974: 303). Parreysia burmana (Blanford, 1869). — Brandt (1974: 279). Pharella waltoni n. sp. — Brandt (1974: 304). Physunio cambodiensis (Lea, 1856). — Brandt (1974: 297). Physunio eximius (Lea, 1856). — Brandt (1974: 295). Physunio inornatus (Lea, 1856). — Brandt (1974: 295). Physunio micropterus (Morelet, 1866). — Brandt (1974: 296). Physunio modelli Brandt, 1974. — Brandt (1974: 297). Physunio superbus (Lea, 1843). — Brandt (1974: 294). Pilsbryoconcha exilis compressa (von Martens, 1860). — Brandt (1974: 264). Pilsbryoconcha exilis exilis (Lea, 1839). — Brandt (1974: 263). Pilsbryoconcha lemeslei (Morelet, 1875). — Brandt (1974: 263). Pisidium (Afropisidium) clarkeanum G. & H. Nevill, 1871. — Brandt (1974: 330). Pisidium (Afropisidium) javanum van Benthem Jutting, 1931. — Brandt (1974: 331). Pisidium (Afropisidium) nevillianum Theobald, 1876. — Brandt (1974: 330). Pisidium (Odhneripisidium) annandalei Prashad, 1925. — Brandt (1974: 332). Pisidium (Odhneripisidium) prasongi Kuiper n. sp. — Brandt (1974: 333). Pisidium (Odhneripisidium) sumatranum Martens in Weber, 1897. — Brandt (1974: 332). Pisidium (s.s.) casertanum (Poli, 1791). — Brandt (1974: 329). Polymesoda (Geloina) bengalensis (Lamarck, 1818). — Brandt (1974: 310). Polymesoda (Geloina) coaxans (Gmelin, 1791). — Brandt (1974: 309). Polymesoda (Geloina) galatheae (Mörch, 1850). — Brandt (1974: 311). Polymesoda (Geloina) proxima (Prime, 1864). — Brandt (1974: 311). Pseudodon cambodjensis cambodjensis (Petit, 1865). — Brandt (1974: 269). Pseudodon cambodjensis tenerrimus n. subsp. — Brandt (1974: 270). Pseudodon inoscularis callifera (von Martens, 1860). — Brandt (1974: 267). Pseudodon inoscularis cumingi (Lea, 1850). — Brandt (1974: 268). 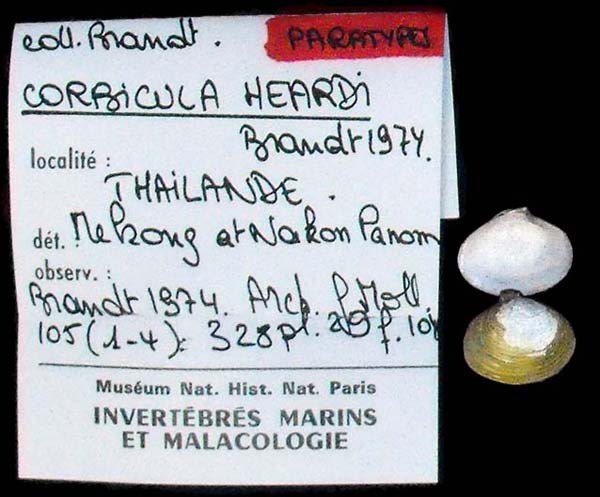 Pseudodon inoscularis harmandi Crosse & Fischer, 1876. — Brandt (1974: 268). Pseudodon inoscularis inoscularis (Gould, 1844). — Brandt (1974: 267). Pseudodon mouhoti (Lea, 1863). — Brandt (1974: 265). Pseudodon vondembuschianus Conrad, 1865. — Brandt (1974: 270). Pseudodon vondembuschianus chaperi Morgan, 1885. — Brandt (1974: 271). Pseudodon vondembuschianus ellipticus Conrad, 1865. — Brandt (1974: 270). Pseudodon vondembuschianus tumidus (Morelet, 1866). — Brandt (1974: 271). Scabies crispata (Gould, 1843). — Brandt (1974: 281). Scabies nucleus (Lea, 1856). — Brandt (1974: 283). Scabies phaselus (Lea, 1856). — Brandt (1974: 283). Scaphula celox Benson, 1836. — Brandt (1974: 255). Scaphula deltae Benson. — Brandt (1974: 255). Scaphula pinna Benson, 1856. — Brandt (1974: 254). Sinomytilus harmandi (Rochebrune, 1881). — Brandt (1974: 307). Sinomytilus morrisoni n. sp. — Brandt (1974: 307). Trapezoideus exolescens comptus (Deshayes in Deshayes & Jullien, 1874). — Brandt (1974: 300). Trapezoideus exolescens exolescens (Gould, 1843). — Brandt (1974: 299). Trapezoideus exolescens pallegoixi (Sowerby, 1867). — Brandt (1974: 300). Uniandra contradens ascia (Hanley, 1856). — Brandt (1974: 289). Uniandra contradens contradens (Lea, 1838). — Brandt (1974: 289). Uniandra contradens crossei (Deshayes in Deshayes & Jullien, 1874). — Brandt (1974: 292). Uniandra contradens dimotus (Lea, 1870). — Brandt (1974: 289). Uniandra contradens fischeriana (Morlet, 1883). — Brandt (1974: 292). Uniandra contradens rustica (Lea, 1856). — Brandt (1974: 291). Uniandra contradens rusticoides Brandt, 1974. — Brandt (1974: 290). Uniandra contradens tumidula (Lea, 1856). — Brandt (1974: 290). Uniandra subcircularis Brandt, 1974. — Brandt (1974: 293). Unionetta fabagina (Deshayes in Deshayes & Jullien, 1876). — Brandt (1974: 280).